In the past, the flashing red-blue glow of an ambulance amid the cluster of freshman-only dorms at Wake Forest has often led students to the conclusion that someone else is being treated for excessive alcohol consumption. The first few weeks of the school year have often been marked by high amounts of parties and intoxication, especially for first-year students. “Freshman year is really exciting and going out to parties is so new for many people that a lot of students overdo it,” said sophomore Olivia Field. However, this year, there has been a decrease in the number of first-year students who have been received medical attention and/or been hospitalized in the first six weeks of school. Last year, 11 students were seen due to excessive alcohol consumption in the first week of school alone. Of these 11 students, seven were first-years. This year, the overall number dropped to five, of which only three were first-years. Also in comparison to last year, the overall volume of students in this statistic continued to decrease as the semester went on. The first six weeks in fall semester of 2017 had 41 first-years seen for medical attention for intoxication, making for an average of about seven students per week. The first six weeks in fall semester of 2018 had 25 first-years seen for medical attention for intoxication, making for an average of about four per week. According to WFU EMS, in only 29 percent of the calls they attended from July 1 to Oct. 31 of this year was the chief complaint intoxication. Further, out of 107 calls, the person they attended to was intoxicated only 38 percent of the time. 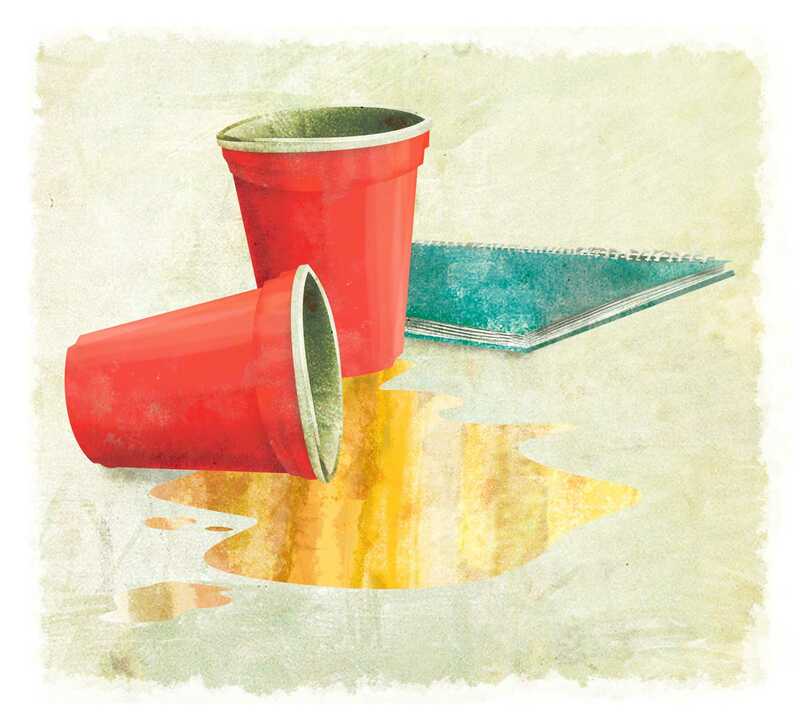 One thing that made this year different was that university officials offered a new approach to their warnings about the risks associated with drinking by providing concrete alternatives to alcohol-soaked parties. Wake the Forest, a program in its first year, aims to reduce students’ drinking by offering sober activities every Thursday, Friday and Saturday night for the first six weeks of the fall semester. All in all, there were 56 events included in the Wake the Forest programs that ran from Aug. 23 through Oct. 6. Highlights included a hypnotist, a welcome concert during orientation, Saturday Night Live, mini golf and Humans vs. Zombies in Z. Smith Reynolds Library, a mind reader, puppy yoga, a day hike and swim and an a-cappella concert. Total attendance across all events was 13,704 students. Freshman Hannah Mo took advantage of several activities, mainly during orientation week. “We’ve moved a lot of activities to late-night to counter the argument that there’s nothing to do,” Rives said. In addition to this new program, Wake Forest employs a wide variety of methods to educate students on smart decision-making regarding alcohol. Before first-years even step foot on campus, they are required to complete an online education course, AlcoholEdu. Upon completion, the program claims that students are almost five times less likely to require medical attention for intoxication during their college career. First-years also attend mandatory information sessions during orientation and active bystander training in late September. To reinforce learning in their new environment, they complete a second round of AlcoholEdu. Yet, these straightforward educational tools alone do not seem to successfully suppress excessive drinking. About 50 percent of incoming Wake Forest first-years drink, according to data collected through AlcoholEdu. Forty-five days later, that statistic has increased dramatically to 75 percent. According to senior Sarah Hambright, Chief of Wake Forest’s student-run Emergency Medical Service (EMS), in addition to responding to medical emergencies of all varieties and to all persons, they receive calls due to over-consumption for students of all levels, many of which are freshman and typically in the beginning of the semester. “Freshman do tend to make up a majority of the alcohol intoxication calls that we respond to on campus,” Hambright said. Once first-years arrive on campus, a common phenomenon dubbed “The College Effect” occurs, providing a possible explanation for the jump in percentage of freshmen who drink. Field agrees with Rives that the lack of a sense of belonging at the beginning of college drives problematic drinking. “Towards the beginning of freshman year, everyone is trying to find their friend group, so they may feel the need to drink and go out to make good friends,” Field said. But, in the course of drinking to find good friends, first-years often find themselves overdoing it instead. In the 2017 – 2018 school year, 61 percent of Wake Forest students who received medical care due to intoxication were first-years. Furthermore, another thing that changed this year were the social partying opportunities available to freshmen at the beginning of the school year. As a community, fraternities decided, on their own, not to invite first-year students to social functions during the beginning of the school year. According to junior Jack Walsh, president of the Interfraternity Council, this was decided in part out of respect for orientation week and the craziness that the first few weeks of school can bring. With all the programs in place to reduce the harm of excessive drinking, as first-years gain their footing and become secure, the hope among campus officials is that they begin to make smarter, better decisions. The inevitability of underage drinking has appeared to become more manageable, shown by an improvement in statistics. Even with alternative options for partying and educational programs in place, Rives acknowledges that he can’t totally prevent underage alcohol consumption – but that’s not his goal. “If you choose to drink, let’s be smart about it,” he said.